Buy tickets to the 2017 season! OPEN SEATING - Sit where you want! 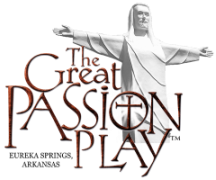 Free performances happen almost every day at The Great Passion Play. The Holy Land begins at 12:00 PM with tours starting every half hour until the last tour at 4:00 PM. In order to have the full experience, it is advised to start your tour by at least 3:30 PM. David the Shepherd is at 7:00 PM and the Parables of the Potter is 7:30 PM. The Great Passion Play begins at 8:30 PM. Get the 1-Use Anytime Ticket and use it on the performance night of your choice during the 2017 season performed May through October.